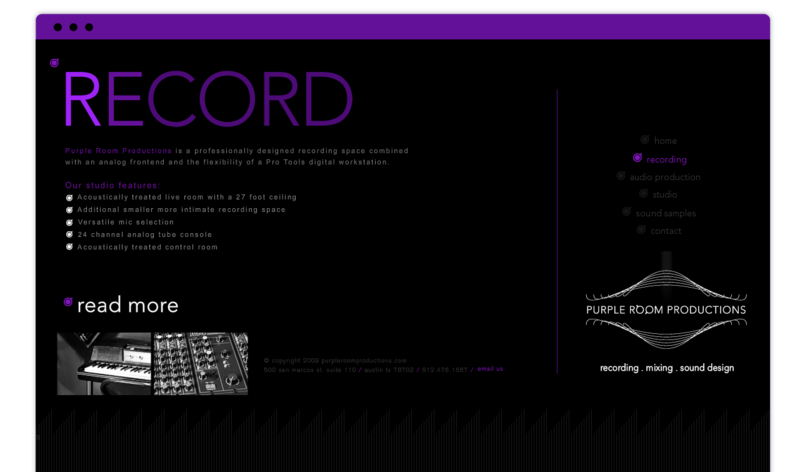 Way Back in 2009 we were approached to design and develop Purple Room Production’s main branding, id and website presence. The site was built strictly in flash with a custom flash admin system. Purple Room Productions is a professional, friendly recording studio/audio production facility located just off world famous Sixth Street in the Live Music Capital of the world Austin, TX. We are fortunate enough to be within walking distance of some of the city’s best live music venues on Red River St. The studio where we are located has been active in Austin for over 25 years and features one of the best live rooms in town with 27 foot ceilings and professional acoustic treatment. The center piece of the Purple Room’s recording arsenal is an amazing 24-channel TL Audio tube console, for that warm, fat analog sound you want as well as the flexibility of Pro Tools. We also have a lounge area to relax or take a nap if the sessions run into the night.